The interaction between cancer cells and their microenvironment is an indispensable link in cancer progression that occurs on the interfaces between them and presents typical biointerfacial behavior. 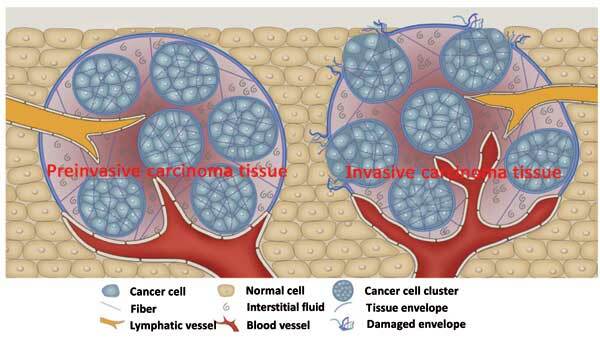 Recently, the cancer cell/microenvironment interface has begun to attract more attention because of its fundamental roles in cancer growth and metastasis, which is promising for the efficacy of anti-cancer drugs and other important effects. In this review, we focused on mechanical coupling of the biointerfaces and their application in cancer early diagnosis, the pharmacology of anticancer agents and the design of the anticancer drug carriers. Newly developed strategies for cancer therapy based on mechanical coupling, such as correcting cell mechanics defects, tunable rigidity for drug delivery and topography-coupled-mechanical drug design, and drug screening, provide a proof of concept that cell mechanics offer a rich drug target space, allowing for the possible corrective modulation of tumor cell behavior. Biomechanopharmacology is therefore important to recognize the biomechanical factors and to control them not only for improvement in our knowledge of cancer but also for the development of new drugs and new uses of old drugs. Cancer cell/microenvironment interface, Mechanical coupling, Cancer drug therapy, Drug screening, Biomechanopharmacology.